Fuel cells could be the next generation energy–saving technology to generate electrical power for our homes and cars. The biggest advantage of fuel cell is that it makes power more efficiently and with less pollution. A fuel cell typically converts the chemical energy of its fuel into electricity with an efficiency of about 50%. Fuel cells are ideally emission–free as compared to common fuels such as methane or natural gas that generate carbon dioxide. The problem is that coal is a relatively dirty energy source, which creates lot of pollution and wastage. Fuel cells on the other hand convert the chemicals hydrogen and oxygen into water, and in turn produce electricity with very little pollution. A fuel cell is an electromechanical device that coverts chemical energy into electricity. It combines hydrogen fuel with oxygen producing electricity, heat and water. The reaction occurs as long as fuel is available. In this manner, a fuel cell is similar to a battery. The oxygen is taken from air while hydrogen is stored in pressurized containers. There are no harmful emissions at all due to the absence of combustion - the process of converting carbon fuel to energy. And the by-product is pure water. (So clean is the water emitted that at one of the power system company, visitors were served hot tea made with it!). A fuel cell can be considered to be electrolysis in reverse. 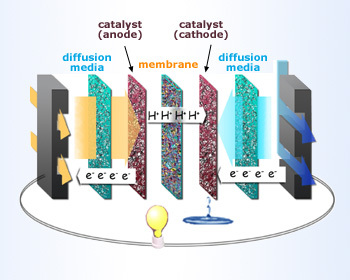 Like in electrolysis, fuel cell has also two electrodes separated by an electrolyte. The negative electrode (or anode) receives hydrogen while the positive electrode (or cathode) collects the oxygen. Hydrogen is separated into positively charged H+ ions and electrons by the catalyst at the anode. The oxygen is ionized and migrates to the anode compartment through the electrolyte. Here it combines with hydrogen. Typically, a single fuel cell produces 0.6 - 0.8V under load conditions. Several such fuel cells can be stacked i.e connected in series to obtain higher voltages of the order of several hundred kilowatts(kW). Hydrogen (the simplest chemical element with one proton and one electron) makes up 90&percnt; of the universe. It is the third most abundant element on earth's surface (after nitrogen and oxygen). So with very easily available raw material, the cost of conversion into electrical energy should be relatively low. But it is not so due to hydrogen being strongly bonded to other substances. It takes considerable energy to separate and get hydrogen gas. In terms of net calorific value (NCV), it is more costly to produce hydrogen gas than gasoline. 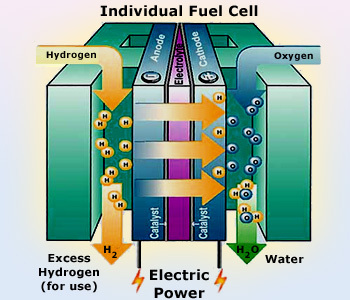 Chemical reactions inside Fuel Cells Hydrogen is the basic fuel, but fuel cells also require oxygen. Much of the hydrogen and oxygen used in generating electricity ultimately combine to form a harmless byproduct – water. A fuel cell is designed to produce electricity required to run any electrical device. The chemical reactions are the ones which are responsible for the generation of electric current. In most of the fuel cells, the hydrogen atoms reach the fuel cell at the anode. The chemical reactions at the anode ionize the hydrogen atoms by stripping off their electrons. These negatively charged electrons move through the wires to produce current. The output of a fuel cell is always DC (Direct Current). If AC (Alternating Current) is required, a conversion device must be used. As the protons pass through a Proton Exchange Membrane or electrolyte, the oxygen atoms coming from the air react with the protons along with the electrons that reach the cathode through the external device, to form water molecules. Hence water is the by product of this reaction which is safe and pollution free. So one great appeal of fuel cells is that they generate electricity with very little pollution. Efficiency of a Fuel Cell car in comparison with normal car Fuel cells generate electrical power quietly and efficiently, without pollution. Unlike power sources that use fossil fuels, the by-products from an operating fuel cell are heat and water. Efficiency: The efficiency of a fuel cell is more than the efficiency of a steam engine which works on the Second law of thermodynamics. In a fuel cell the fuel and oxidant combine in a controlled electrochemical process which avoids the intermediate generation of heat and the corresponding inefficient conversion of heat energy to mechanical and electrical energy. Efficiencies as high as 60% have been achieved. Modularity: The fuel cell can be made with out any restriction on its size, depending on the requirement of the output voltage. A typical fuel cell produces only 0.8 volts, which is not enough and thus the cells are layered and combined stack to create considerable amount of electricity. The number of cells used is usually greater than 45 and may vary with the design. Maintenance: Fuel cells have no moving parts and don&apos;t use any fossil fuels for generation of electricity. Hence the maintenance costs are extremely low. Current Densities: One can achieve the current densities as high as 10A/m2 with the voltage up to 0.8 Volts. Catalyst: A catalyst and a high temperature environment must be needed for the functioning of the fuel cell to increase rate of combination of oxygen and hydrogen atoms. What are the different types of fuel cells? There are four main types of fuel cells. (i) Phosphoric Acid Fuel Cells (PAFC): In this type of fuel cells phosphoric acid is used as an electrolyte. These were the first type of fuels cells to be commercialized all over the globe. The operating range of temperature of this fuel cell is from 150 to 200° C. Also the efficiency of this type of fuel cell is 70%. The output of this fuel cell is water vapor. The disadvantages of this fuel cell is low power density and an aggressive electrolyte. Applications of this type of fuel cells include the power store houses of submarines, Navy, etc. (ii) Molten Carbonate Fuel Cells (MCFC): These are high temperature fuel cells operating at more than 600°C. These are developed for natural gas, bio gas and coal based power plants for electrical utility. 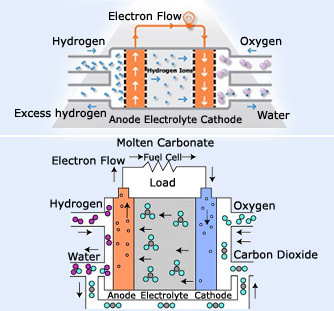 This type of fuel cell uses molten carbonate salt mixture as an electrolyte (see figure below). The efficiency of MCFC could reach 60%. When the waste heat can be captured the efficiencies might touch 85%. The primary disadvantage of current MCFC technology is durability. The high temperatures at which these cells operate and the corrosive electrolyte used accelerate component breakdown and corrosion, decreasing cell life. (iii) Solid Oxide Ceramic Fuel Cells (SOFC): It has a ceramic electrolyte and oxidation of the fuel takes place. Advantages of this class of fuel cells include high efficiency, long–term stability, fuel flexibility, low emissions, and relatively low cost. The largest disadvantage is the high operating temperature which results in longer start–up times and mechanical and chemical compatibility issues. 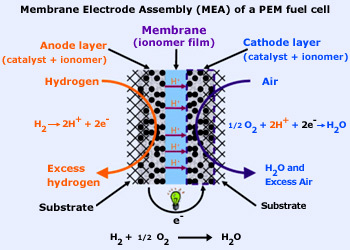 (iv) Proton Exchange Membrane Fuel Cells (PEMFC): These are also known as Polymer Electrolyte membrane fuel cells. This is a typical fuel cell that is being developed for the transport applications and portable fuel applications. They are a leading candidate to replace the aging alkaline fuel cell technology, which was used in the Space Shuttle. The practical efficiency achieved using this type of fuel cell is around 40 to 60%. Some of the other fuel cells are biological fuel cell, alkaline fuel cell, Direct borohydride fuel cell, Direct methanol fuel cell and solid oxide fuel cell. The proton exchange membrane fuel cell (PEMFC) is one of the interesting fuel cell, which will help power cars, buses and homes. The advantage of a fuel cell in comparison to a battery is that, it doesn&apos;t go dead. Battery either has to be thrown or recharged, whereas fuel cell goes on and on. Chemicals constantly flow into the cell and thus the electricity flows out of the cell. Many fuel cells in use today use hydrogen and oxygen as the chemicals. The fuel cell will compete with many other types of energy conversion devices, including the gas turbine of power plant, the gasoline engine in cars and autos, the batteries in computers and other hand held devices – for the simple reason that they do the task of producing electricity and mechanical work at the same time. A fuel cell provides a DC (direct current) voltage, which could be used to power electrical appliances like motors to run vehicles (see figure). Reformer of a Fuel Cell A reformer turns hydrocarbon or alcohol fuels into hydrogen, which is then fed to the fuel cell.Since the hydrogen fuel reformer is extracting the hydrogen itself, the reformer has to clean up the hydrogen and separate it from the rest of the heat and gases that get produced during the reforming process. This complicates the phenomenon. The oxygen required for a fuel cell comes from the air. However, the hydrogen is not so readily available. Hydrogen storage has got some limitations that make it impractical for its use in most of the applications. Hydrogen is difficult to store and distribute, so it would be much more convenient if fuel cells could use fuels that are more readily available. A device called a reformer addresses this problem. 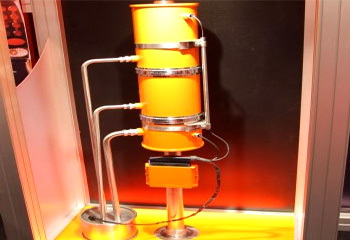 The reformer extracts the pure hydrogen from a hydrogen source, such as hydrocarbon or alcohol fuels, and then provides the hydrogen to the fuel cell. Unfortunately, reformers are not perfect. They generate heat and produce other gases besides hydrogen. They use various devices to try to clean up the hydrogen, but even so, the hydrogen that comes out of them is not pure, and this lowers the efficiency of the fuel cell. 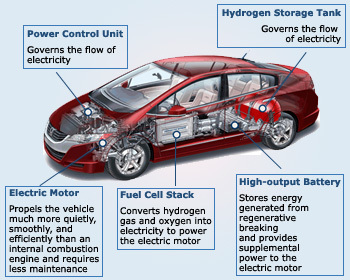 Fuel–Cell–Powered Electric Car Instead of a battery, a hydrogen fuel cell car has a hydrogen fuel cell. Hydrogen is difficult to store in a car. However by adding a reformer, methanol can be converted to hydrogen, and can thus be used for the fuel cell. To convert the electrical energy into mechanical work an electric motor and inverter are used. After the consumption and production of electricity the overall efficiency drops to about 24 to 32 percent. 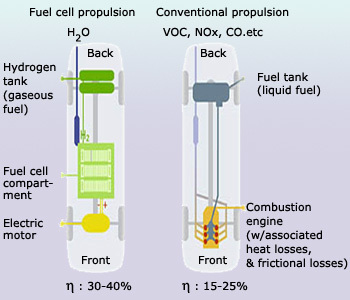 Fuel Cell Vehicles (FCV) look like traditional vehicles but the difference is at the core where the FCV is powered by the fuel cell stack that converts the stored hydrogen and oxygen from the air in to electric power which drives the motor of the vehicle. The functions of the fuel cell stack, hydrogen storage stack, electric motor, power control unit and high&dash;output battery are briefly described in the adjacent figure. Portable Fuel Cell to charge a Mobile Phone It uses a replaceable hydrogen cell to charge mobiles, smart phones, tablets or whatever needs power, delivered at the same speed as a wall charger. 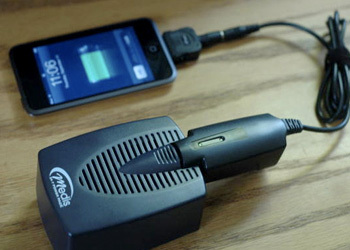 Fuel cells can be used for portable electronics like laptop computers, cellular phones or even hearing aids. In these applications, the fuel cell will provide much longer life than a battery would, and you should be able to "recharge" it quickly with a liquid or gaseous fuel. The problem with the portable fuel cell devices is the cost. The inflammable gases that are present in the device are always a threat to the one that carries it. Keeping all these things in mind, even though there are some companies who brought out their best engineering skills in making a perfect portable fuel cell, it hardly hit the customer&apos;s eye. The bus was one of the first applications of the fuel cell because initially, fuel cells needed to be quite large to produce enough power to drive a vehicle. 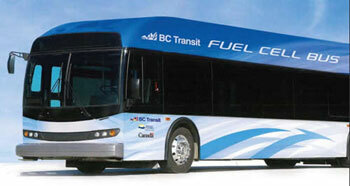 In the first fuel–cell bus, about one–third of the vehicle was filled with fuel cells and fuel–cell equipment. The power density has increased to the point that a bus can run on a much smaller fuel cell. Large Power Generation from Fuel Cell Technology In all their potential applications (residential, commercial, industrial, or institutional, in distributed generation or in central power plants) high-temperature fuel cells indeed portend a profound change in the manner by which power will be generated in the decades to come. Home power generation system uses a natural gas or propane reformer and produces up to seven kilowatts of power (which is enough for most houses). A system like this produces electricity and significant amounts of heat, so it is possible that the system could heat your water and help to heat your house without using any additional energy. Some fuel–cell technologies have the potential to replace conventional combustion power plants. Large fuel cells will be able to generate electricity more efficiently than today&apos;s power plants. The fuel–cell technologies being developed for these power plants will generate electricity directly from hydrogen in the fuel cell, but will also use the heat and water produced in the cell to power steam turbines and generate even more electricity. 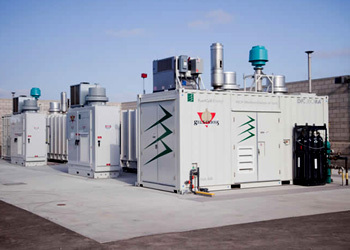 There are already large portable fuel–cell systems available for providing backup power to hospitals and factories. A new application is combined heat and power (CHP) for family home, office buildings and factories. This type of system generates constant electric power (selling excess power back to the grid when it is not consumed), and at the same time produce hot air and water from the waste heat. Phosphoric–acid fuel cells (PAFC) comprise the largest segment of existing CHP products worldwide and can provide combined efficiencies close to 80% (45–50% electric + remainder as thermal).